R Chahal, S Acharya. Multiple fibromatosis in Lower limb: A Case Report. The Internet Journal of Orthopedic Surgery. 2006 Volume 7 Number 1. We present a case of 14 year old girl, who presented to us with 2 swellings one in the left thigh and other in the left foot which had a scar over it, patient has been noticing these swellings from last one and half year and did not inform any one, there has been progressive increase in size of both these swelling although they were relatively painless as such. Due to swelling of the foot there was overriding of the second toe for which she under went a surgical procedure to correct the alignment, but surgeon ignored the swelling and no biopsy was done. Popliteal vessels had to be sacrificed and reconstructed using contra lateral long saphenous vein (Fig 4). Common peroneal could not be saved. Two weeks later foot swelling was excised, since it involved the metatarsals ray excision of 2 nd & 3 rd phalanx along with distal half of metatarsal was done. Biosy of both the specimen came out to be fibromatosis. Both the wound healed well and patient was mobilized with foot drop splint. No adjuvant treatment was given and during the one year of follow-up, the patient has remained asymptomatic, with no restrictions of daily living. There were no clues as to recurrence of the tumor as there is no growth as confirmed by two MRI's one at six month and other at one year. Aggressive fibromatosis is also known as extra-abdominal fibromatosis, extra-abdominal desmoid tumour, desmoid tumour, well-differentiated non-metastasising fibrosarcoma, desmoid fibromatosis, and even fibrosarcoma grade I desmoid type. It should be distinguished from desmoid tumour of bone (desmoplastic fibroma) which is an intraosseous fibrous tumour which originates from bone. Aggressive fibromatosis is a fibroblastic tumour, arising from the connective tissue of muscle and the overlying fascia or aponeurosis. It is locally aggressive, growing to large sizes and well known to invade nearby structures such as muscle, subcutaneous tissue and neurovascular structures. Despite its outwardly aggressive nature, histologically it consists of uniform spindle cells with a variable amount of collagen, and no nuclear atypia or abnormal mitoses. The tumor is not known to metastasize, but considerable morbidity and dysfunction may be present when surrounding structures are involved. 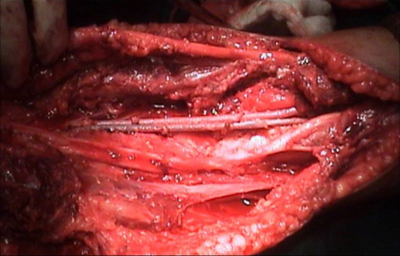 There is a high rate of recurrence after surgical excision, as the tumor margins often extend beyond that palpable, and its infiltration into deep seated areas makes it difficult to achieve wide excision without sacrificing vital structures. Local recurrences occur usually within 12 months after surgery. Imaging modalities, especially MRI are useful to determine the extent of lesion and follow up. Adjuvant therapy using non steroidal anti-inflammatory agents, tamoxifen, interferon, anti-neoplastic agents, and radiotherapy, either alone or in combination finds application for unresectable or recurrent cases. Rosen and Kimball (2) first described localised periosteal thickening and frank bony destruction by aggressive fibromatosis. In 1979, McDougall and McGarrity (3) reported two cases of aggressive fibromatosis involving the bone. Abramowitz et al in 1983(4) clearly defined two patterns of bone abnormalities present in aggressive fibromatosis in eight of their patients. The first was non-specific pressure erosion of the adjacent cortex, presenting as a lytic, saucer-like cortical defect with a sclerotic margin. The second was a distinct ‘frondlike' appearance of the adjacent bone, seen as spicules of bone radiating into the soft tissue mass. This is thought to be produced by periosteal stimulation of the bone by the tumour. In none of his cases was there evidence of intramedullary involvement. Our patient is of interest because of the radiological changes of involvement of the metatarsals.Tumour tissue was seen invading into the metatarsals. 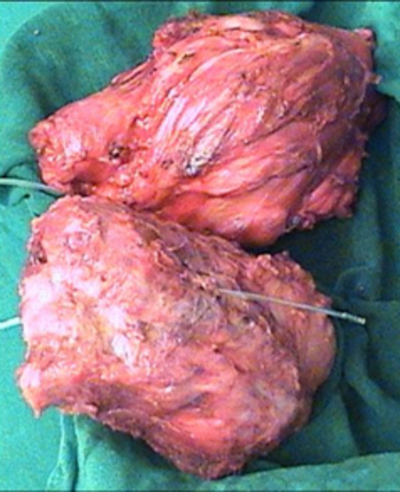 The resection margins from the thigh surgery were free of tumour. There was no bony involvement in the thigh but popliteal vessels and the peroneal nerve was inseparable from tumor tissue. This case illustrates that radiological changes are due to pressure effect rather than direct infiltration. The cortical bone can resist invasion of the tumor. The tumor can spread into the medullary canal if the cortex is breached following surgical removal or fracture. 1. Ackman JB, Whitman GJ, Chew FS. Aggressive fibromatosis. AJR Am J Roentgenol 1994; 163:544. 2. Rosen RS, Kimball W. Extraabdominal desmoid tumour. Radiology 1966; 86:534-40. 3. McDougall A, McGarrity G. Extraabdominal desmoid tumours. J Bone Joint Surg 1979; 61B:373-7. 4. Abramowitz D, Zornoza J, Ayala AG, Romsdahl MM. Soft tissue desmoid tumours: Radiographic bone changes. Radiology 1983; 146:11-3.